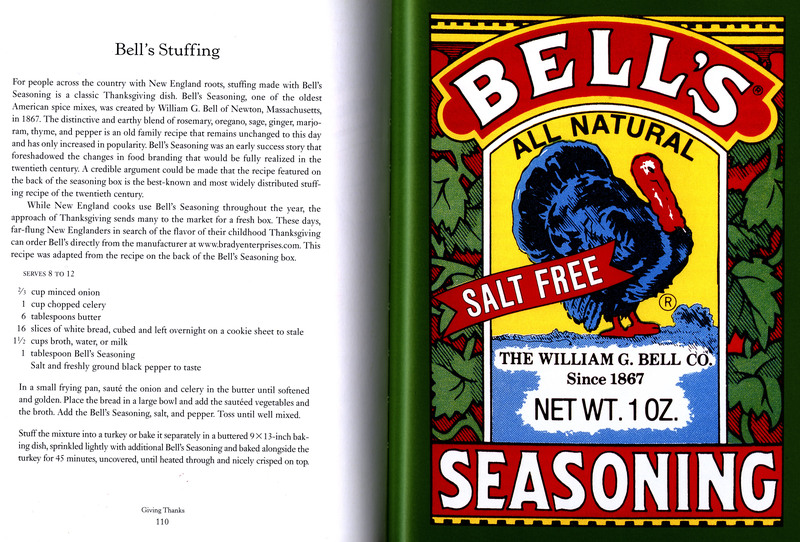 thanksgiving – What's Cookin' @ Special Collections?! What's Cookin' @ Special Collections?! Thanksgiving week is here! Special Collections is open through noon on Wednesday, but we’re all thinking ahead. In the meantime, it seems like a fun idea to talk turkey. (Or, at least look at them!) Agriculture plays a BIG part in culinary history and Virginia Tech history. So, it can’t be all that surprising we have material relating to all manner of poultry. Whether you’re looking to raise, exhibit, judge, cook, or eat, we probably have a publication for you. This week, we’re focusing on the turkey. And you might be amazed at the variety of breeds and things you might need to know about them. Happy Thanksgiving (and eat well)! In 1864, a 20 year old man named Daniel Lowber enlist with the 13th Independent Battery of Wisconsin Light Artillery. In March of the same year, he transferred to the 37th Wisconsin Infantry, eventually rising from the rank of private to a captain by September. Lowber was twice wounded at Petersburg (in 1864 and 1865), but he survived the Civil War and lived until 1902. He kept a diary during 1864, and it currently resides among our Civil War collections. What is of particular interest this week, even though this isn’t a History of Food and Drink related collection, per se, are two entries made in November 1864. 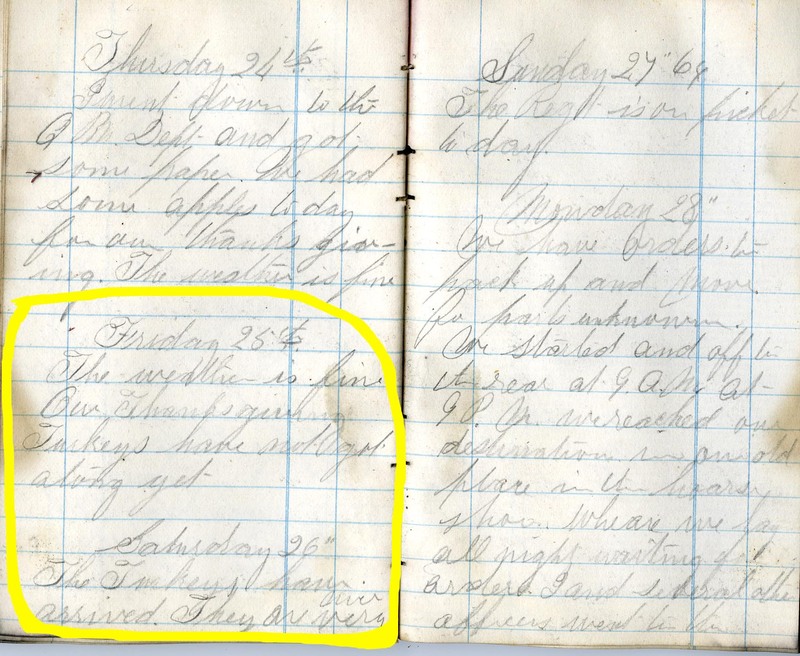 Entries from Danial Lowber’s diary in late November 1864. Friday 25th The weather is fine. Our Thanksgiving Turkeys have not got along yet. Thanksgiving has a long history in the United States and it was a long road to becoming a national holiday, a feat not completed until FDR’s third term in office. Individual presidents issued proclamations prior to the war, but Lincoln began the tradition of yearly proclamations in 1863 (in large part to the 20+ years of work by Sarah J. Hale). You can see see George Washington’s 1789 and Abraham Lincoln’s 1863 proclamation, as well as the 1941 the joint resolution by Franklin Roosevelt and the 77th Congress here. Wherever you are this year, we hope your Thanksgiving does include turkey and we hope you enjoy the holiday to its fullest. Happy Thanksgiving! Archivist/blogger Kira here again…Last week, I gave a talk for a Peacock Harper Culinary Friends luncheon, I started out investigating the question “was the first Thanksgiving [in the modern United States] in Virginia?” Like many good research topics, the answer wasn’t a clear one. As a result, my talk became more a look at the early history and evolution of Thanksgiving as a holiday, and how I felt Virginia contributed to the holiday leading up to to the 20th century. A number of people asked for copies, so I thought I would post it here. Many thanks to those of you who attended! Although this week’s highlight is a little more modern in terms of its publication date, it is certainly historic in content. While digging around for something Thanksgiving-oriented, I was pleased to find this little gem. And of course, since two of the things I LOVE about working with the culinary history collection are old advertisements/ pamphlets and recipes—voilà! 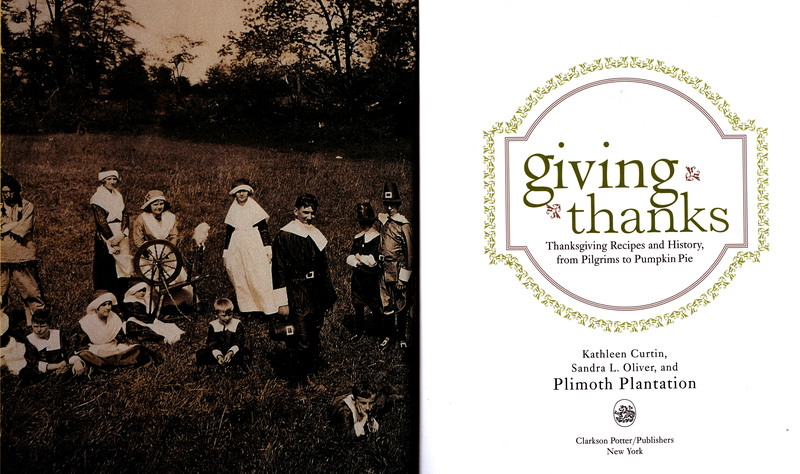 Enter Giving Thanks: Thanksgiving Recipes and History, from Pilgrims to Pumpkin Pie (2005). The first third of this book is all about the history of the holiday, including regional favorites, modern additions (can I interest you in turducken or tofurkey? 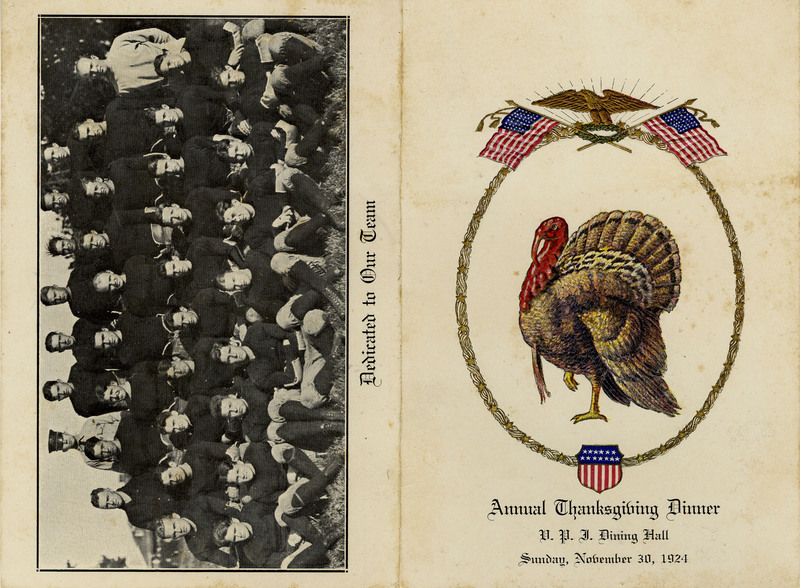 ), turkeys and presidental pardons, war-time changes, and everything in between. Whatever you’re eating this holiday, whether it’s turkey or tofu, stuffing or dressing, sweet potatoes or mashed, and pumpkin or pecan, have a little extra. It all tastes so good it’s hard to resist. C’mon, we won’t tell. Enjoy your food and company. And have a Happy Thanksgiving! This Thanksgiving, two turkeys from Minnesota will travel to the White House to be pardoned by President Obama. The annual tradition began in 1947 when the Poultry and Egg National Board presented a live turkey to President Truman for the holiday. Earlier presentation birds did not fare as well as their modern day counterparts and were handed over for, ahem,dining, rather than pardoning. This photo shows the Thanksgiving Turkey Presentation to President Nixon on November 18, 1969. As you might imagine, we’ve got a number of POTUS photos from previous turkey days in our holdings. 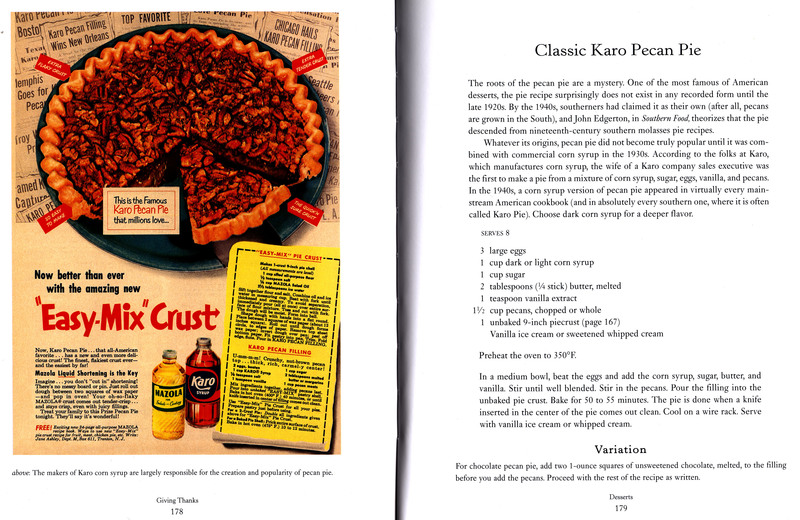 This week, I thought I’d share something related to the Culinary History Collection, though not actually part of it. Food seems to permeate so much of our lives, it doesn’t seem like too much of a diversion. Thanksgiving is just a week away. And while these days, our students get time off, that wasn’t always the case. 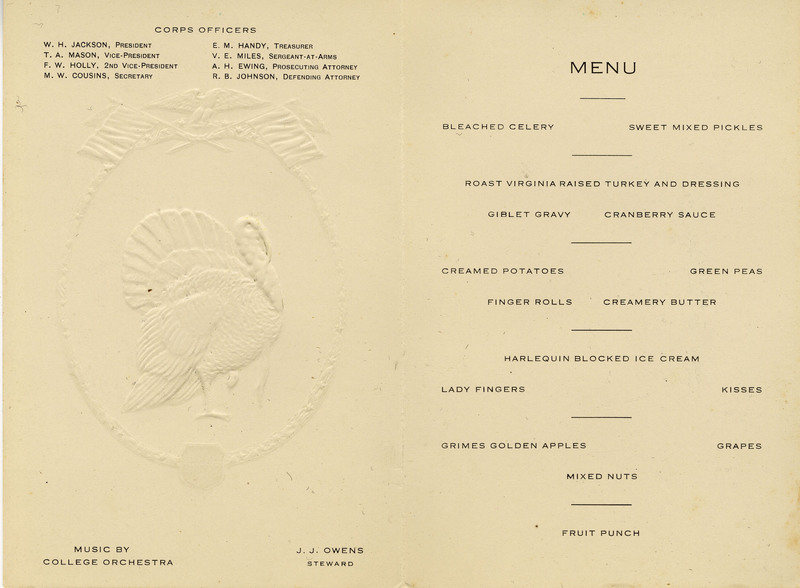 This is one of several Thanksgiving menus from the University Archives (which seeks to document the history of university). From 1924, it includes a picture of the football team, who would have had a big game on or around November 30. Cadets were treated to a special meal for the holiday. Some of the dinner is familiar and still traditional today (turkey, cranberry sauce, dressing and gravy, etc. ), but there are a few things worth noting. First, the Grimes Golden apple is now considered an heirloom variety and unlikely to be in grocery stores (though if you can find it, it is rumored to make a wonderful “pie” apple). Second, instead of pie, our cadets were treated to lady fingers, ice cream, fruit, and nuts. And fruit punch! Third, there was a band! So, this year, consider hiring a live orchestra and replacing pie with cookies, if you’re feeling adventurous. Or stick with the modern traditions—we DO love them for a reason. Expect another “turkey day” post or two before the big day, but here’s an early Happy Thanksgiving! from us to you.